Being emotionally competent, being emotionally intelligent or being emotionally literate become really important specially when we are living in a world which is so diverse and full of intellectual brains around having different level of expectations, IQ’s & EQ’s . How to stand out, how to sustain and survive is all what is at stake specially in corporate professional workplaces. What Do You Mean By Emotional Competence ? Emotional competence refers to one’s ability to express or release one’s inner feelings (emotions). It implies an ease around others and determines one’s ability to effectively and successfully lead and express.It is described as the essential social skills to recognize, interpret, and respond constructively to emotions in yourself and others. An emotional competence is a learned capability based on emotional intelligence that results into an outstanding performance at work. Its an ability of humans to artfully manage the feelings of people around them with a sense of certain empathy and gratitude, which gradually helps to express themselves in a way which is constructive, productive and acceptable in a society or at the workplace. intrapersonal (inside, self) and other deals with interpersonal (relationships). 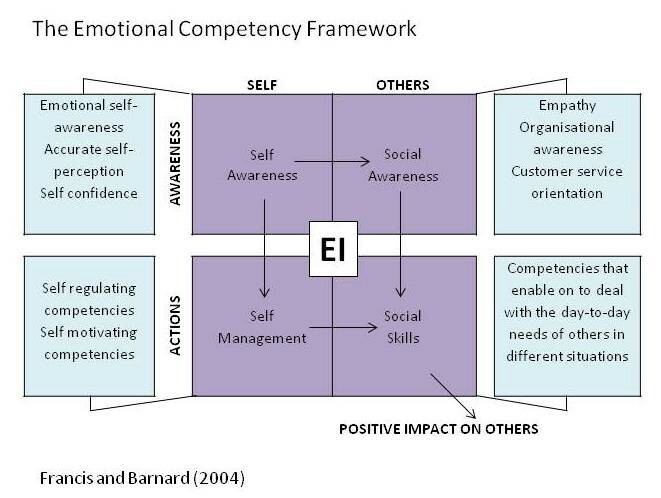 To understand how it works , lets understand Emotional competence framework as a whole which puts light on Emotional Competence in an elaborate manner. Emotional Intelligence is portrayed by a person when s/he demonstrates the competencies that constitute self-awareness, self-regulation/management, relationship management and social awareness at appropriate times and ways in sufficient frequency to be effective in the situation. Social Competence : is how we conduct ourselves in relationship handling. People with high level of self-awareness are great at managing their emotions. They understand themselves fully and are great in understanding their goods and bad feelings. They are confident in whatever task they delegate and also ensures that they showcase right amount of emotions to fit into the workplace or situations they are put into. Emotional Awareness : Addressing to one’s own feeling and the outcome of the same. Being true in accepting and ensuring the onus of any goods or bad is one the self. Self-confidence : This emotional intelligence help people to be absolutely sure of their abilities, it gives them confidence on their self-worth, they are decisive in their approach and can stand against the odds by voicing their concerns with confidence and clarity. This aspect keeps a check and balance on the individuals emotions and helps them to approach with a balanced mindset while expressing it. People with this skillset have a controlled aggression and present a right kind of their individualistic traits . In trying situations it gives them strength to control their impulses and saving them from unwanted stress. Self-Control: It help individuals to manage their uncontrollable emotions and check their impulses. In the moment of distress people with this emotional skills are well equipped to stay composed , positive and unflappable. Trust-Worthiness : If you are professionals this one skills needs to be in your kitty. People with high level of integrity and honesty shines among their peers and flourish with flying colors. They value their work ethics, admits their mistakes, confront them and so they depict impeccable honesty to whatever deed they perform. Conscientiousness: people with this skills are front-runner in taking responsibilities for their actions.They takes accountability for their performance and therefore are true to their work commitments and deliveries. They are highly organized and plan their task objectively to meet the deadlines.They are the most sought after resource for any corporates and startups specially dealing in service sectors. Innovativeness: people with this emotional competence are fearless and love to try out new technologies or skills to be learned . They are open to new ideas and see things with much wider perspective. They love to take challenges and experiment with their own skill-sets to meet the future demand of any new technology or work. They are preferred assets for many research and idea oriented companies. These breed of people puts high standards for themselves and strive to excels in whatever field they engage in. They are self motivated and take inspirations from the people who have excelled in their respective fields . For them results matters the most not the outcome. They are certain in their goals and leaves no stones unturned to meet them. Achievement Drive : People with this emotional competence are driven by excellence . They work hard and work upon themselves to meet the high standards which they set for themselves. They set challenging goals and take calculative risk to materialize it. They improve and learn to mitigate the risk of failure in whatever endeavor they pursue. Initiative : People with this kind of trait are always prepared to take on new challenges or opportunities and act on it. They are go-getter and act beyond expectations to meet their desired goal, they overcome all obstacles and set new rules if existing ones are not working to mobilize their troops and get the task done. They are an Opportunity Seeker & Seizer. Optimism : People with this kind of trait are hardly disappointed with shortcoming and failures, they develop positive perception to see challenges and make ways to overcome it. They act out of hope to succeed and reject the fear of failures. In social dynamics our real test of character and emotional abilities are put to test. It can be your workplace, social gathering, home or events for that matter. Her how well you gel-up with others depends upon your social competence. These emotional intelligence aspect needs you to respect others feeling and manage your response according to it. So eventually this aspect has to do more with managing others . Service Orientation : People with high social skills are great at client servicing. They are smart enough to asses client needs & act accordingly to meet their needs on time. Seek ways to increase staff and clients’ satisfaction and loyalty & are happy to offer appropriate assistance to Grasp other’s perspectives, acting as a trusted advisor. Helping Others To Develop : People with this competence always respect other peoples effort , acknowledge it . They help them to bolster their skill sets . They work towards others development by giving them necessary environment and tools to flourish. They mentor , coach and offer assignments that challenge and grow a person’s skills. Leveraging diversity : its an ability to cultivate opportunity from diverse set of people. People with this capability learn adapt and thrive with people and culture of diversity. They respect and relate well to people are all backgrounds and are quite sensitive to group differences . Political Awareness: People with this competence are smart enough to read key power relationships. They are great at sighting forces which impacts clients and competitors actions and which shapes their view, so they successfully leverage their power management skills to thrive at organizational level. Influence: It deal with the effective way of persuading people. People with this emotional competence are highly skilled in building a rapport which has credibility . They can influence people with their charm and readiness to build consensus and support. Leadership: A skill to inspire & guide the troop to achieve the impossible. People having this emotional aspect great at inspiring others to articulate and motivate the group with a shared vision. They always lead by example and are great in getting the task delivered for larger vision and purpose. Change catalyst : People with this emotional competence are great believer of “change is constant “ , they face the challenges and reject the status quo to accept the change. They are change catalyst and successfully involves others in the pursuit to adapt the change. Conflict management: People with this emotional competence are excellent negotiator and resolve any disagreements between two parties or group. They excel in managing hard nuts in adverse situations with their diplomacy and tact. They are solution oriented so foster constructive dialogue openly . So if you want to excel in your work and at your workplace you not only need to have cognitive skills but also these emotional competence. 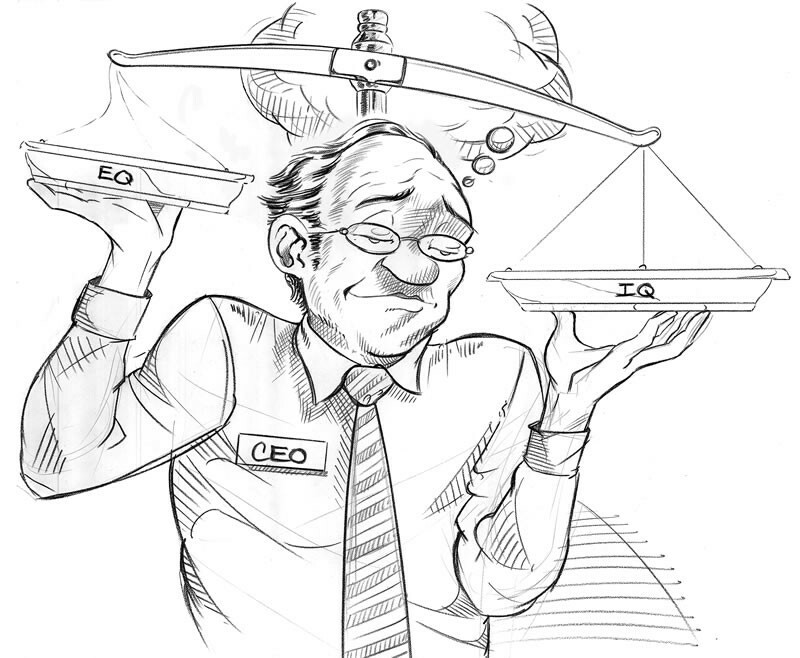 Decision maker in any corporate in most of the survey has communicated this fact that the people who depict strong emotional intelligence are the one’s who are standing out and performing at their peek level. They are the real champion as they foster great team work and are ensure that the task is well communicated and done in good faith. Would like to thanks Daniel Goleman to inspire me & giving me right perspective to pen down this article. His Book emotional intelligence has all what one needs to learn to be a start performer. Go get it, read it and see the change be the change . Thanks to all your awesome reader for being there with me and inspiring me to write. Keep Clapping , Keep sharing …..